Rather than offer words of congratulations, or at least ones of comfort, the first comment to be posted on a local website, once it uploaded the news that shooter William Chetcuti had finished eight in his discipline at the Beijing Olympics, berated the Maltese sportspeople for not doing better. How is it, this particular comment asked, that smaller or poorer countries could claim medals whilst we happily celebrate mediocrity? For how much longer were we going to keep on supporting people going on public funded holidays? Admittedly this comment was a lone voice – subsequent posters rebuked him, to put it mildly, for expressing such views. But it would be foolish to believe that he was alone in thinking like this… his were the type of questions heard far too often. The Maltese Olympic Committee’s director of sport, and the man responsible for setting out the targets for Maltese athletes, Pippo Psaila, must get asked such questions more than most. Which is why I asked him if the Maltese people were right to expect better performances from their athletes if they are better supported now than ever before. He explained that many don’t put Malta’s level of funding in its correct perspective and we should only make a cross reference to a country similar to us… like Cyprus. “For the Beijing Olympic Games’ preparation, each Cypriot athlete who qualified received €2,200 per month to support their training and coaching, plus an international travel grant for competitions of around €50,000. Money, or the lack of it, is at the root of the problem according to Mr Psaila and, contrary to what most people seem to believe, local sport isn’t rolling in it. Ambitions, therefore, have to be drawn up accordingly. Viewed in this light, it is impossible not to label 2008 a success. Apart from Chetcuti’s finish – the best placing ever by a Maltese sportsperson at the Olympic Games – there was the more recent silver medal won by shooter Ryan Bugeja in the Commonwealth Youth Games. Such athletes will be among those honoured at the seventh edition of the Malta Olympic Committee Awards being screened live on television tonight. Every athlete who makes it through the selection process, after being nominated, gets awarded in either the Platinum, Gold, Silver, or Bronze categories in recognition for their highly outstanding achievements and performances on the national, and international, sporting field during 2008. 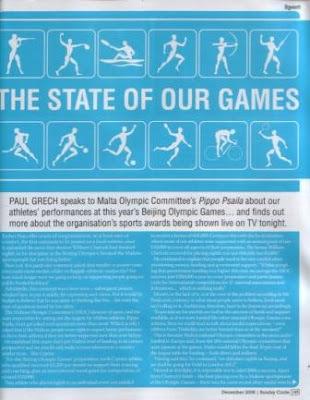 Mr Psaila plays a critical role in determining who gets what, being the chair of the organising committee, although the final word belongs to the Malta Olympic Committee executive. He sees the awards – and the fact that they are dished out by the Olympic committee itself – as being vital for the recognition of sports peoples’ achievements. Perhaps a strong sign that local sport is progressing comes from the fact that initially it was something of a struggle to award winners in years where there were no Games for the Small States of Europe, this is no longer the case. That this includes events that can, perhaps, only loosely be defined as sport, doesn’t sit comfortably with some. Indeed, in the past, these awards have had criticism leveled their way for rewarding, among others, sports like table football. In typical Pippo Psaila fashion, his reaction to this is forthright. “We use the definition of sport as defined by the Council of Europe and yes, by this definition they are sports, even though there is so much subjectivity. The message here is clear: this is not an event aimed at pampering athletes who don’t deserve it, but rather a clinical exercise aimed at praising those who truly deserve it. And, even though a medal at the Olympic Games continues to elude Malta, rest assured true progress is being made.